The Greenville Public Library is thrilled to be the recipient of a beautiful work of art donated by Jim & Enid Goubeaux. “We purchased this painting in New York in 1999 and it has hung in our home since that time,“ they shared. Avid art collectors for many years they wanted to find a home for News for the Delphi Oracle before their upcoming move to Chicago. 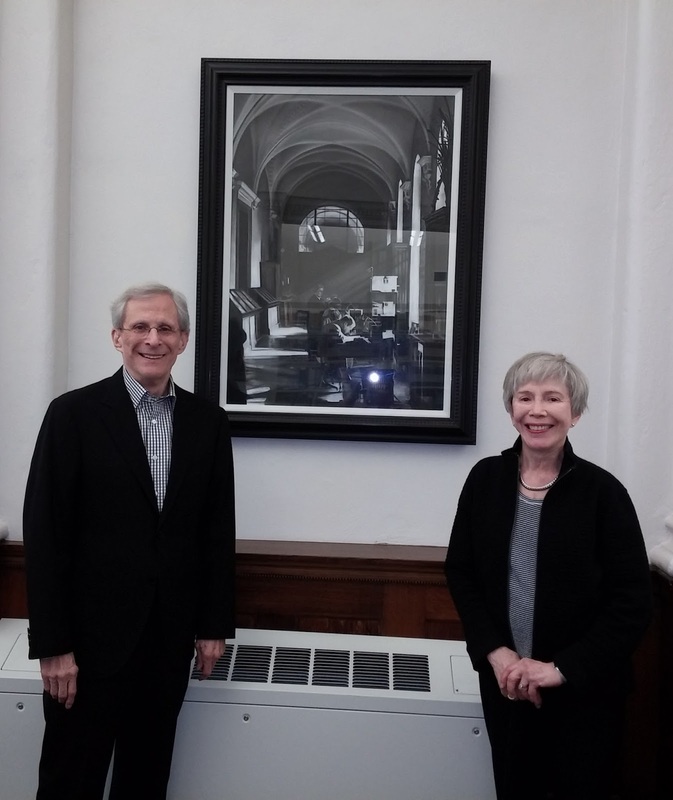 Now the 39 X 27 inch pastel on linen hangs by the Reference Desk on the second floor of the Library. Jim & Enid felt this spot was appropriate because the painting has a “library” theme. As with any work of art it draws in the viewer to appreciate ever greater levels of subtlety. Zalopany was born in Detroit Michigan in 1955 and lives and works in New York City and Sutri Italy. She is currently a professor at the School of Visual Arts and a Visiting Lecturer at Harvard University. More of her works can be seen at www.michelezalopany.com. The Goubeaux’s are patrons of the performing arts as well as the visual arts and have sponsored numerous DCCA events at the Memorial Hall in Greenville as well as having been music supporters regionally. Many people have enjoyed spectacular concerts thanks to their generosity. They joked that people collect art until they run out of wall space. Their new apartment holds much of their original collection. The Library is happy this piece is to stay in town.